Leave No Bear Behind Part 22: The Return! M@ Leave No Bear Behind Part 22: The Return! Long-time readers will recall our campaign of 2010 and 2011 to rescue the unloved toy animals of London, and to raise awareness of their plight around the capital. We found harrowing evidence of crushed zebras, lynched tiggers and Muppet suicides. For a while, the problem diminished. The message seemed to have hit home: leave no bear behind. 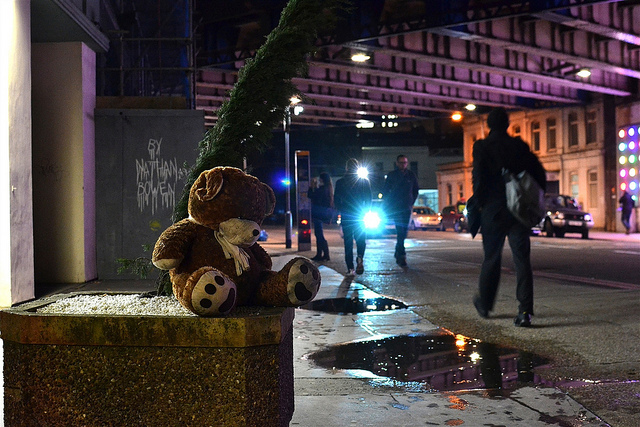 Then we heard from Londonist Flickr contributor John Wilkes, who spotted this discarded ursine on Southwark Street. "I felt somewhat sorry for the bear as it was in good nick and rain was due to arrive in just a couple of hours. I hope someone gave it a home, it was certainly gone come the morning." A sorry sight indeed. We hope this is not the beginning of a new wave of crimes against cuddly toys. If you've seen evidence of abandoned playthings in London, please send photographs to matt@londonist.com, who is spearheading this important campaign.